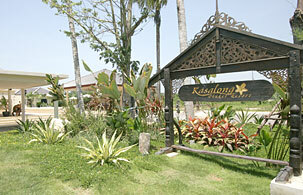 Kasalong Phuket Resort is Your Home Away from Home, giving the great experience of Thai living. Each villa features with bedroom, seperate living room and kitchen , and private balcony. Located only 5 minutes from the airport and 3 minutes short-drive to beautiful Nai Yang Beach by free hotel's shuttle. Salt water chlorinated swimming pool. Picnic Hamper (chargeable on request). Complimentary transfer from hotel to the beach (3 minutes). Rates are quoted in Thai Baht per night and inclusive of 10% service charge and applicable government tax. Reservations are held until 1600 hrs only, unless guaranteed by credit card or first night deposit. Check-in time is 1400 hrs., check-out time is 12.00 noon. These rates are exclusively for the internet online user and cannot be used in conjunction with other promotions. Extra bed will be charged at THB 500 net (Complimentary for children under 12 years old, sharing accommodation with parents). Transportation from Phuket International Airport to hotel can be arranged upon request at the following rate: One-way trip, capacity 3 persons: THB 300 per way (No charge for children under 5).